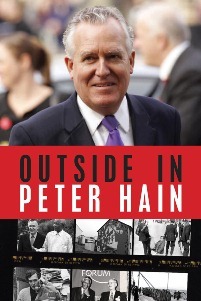 Former anti-apartheid leader turned Labour cabinet minister Peter Hain reflects on his early campaigning days, being prosecuted in two political trials and his role in negotiating the historic 2007 settlement in Northern Ireland. Carl Packman finds it a remarkably honest and modest account, concluding that Hain proves to be a politician of true principal. Outside In. Peter Hain. Biteback Publishing. January 2012. The problem of somebody writing a book about their own life is that they can gloss over the bad times and re-write to suit. How anybody is supposed to trust a politician doing it is beyond me. When I read Tony Blair’s A Journey, not only was I mostly bored to tears, I could feel the self-importance and arrogance drip off the pages as they slid through my fingers. I’m happy to report that on reading Outside In by Peter Hain I did not have the same feeling. In fact one is struck by Hain’s modesty – which I suspect is partly based on his own personal appeal to influences such as Nelson Mandela. The way in which Hain recalls fond memories of Mandela, while living in South Africa as a young man, with his parents who were Liberal Party anti-apartheid activists, calling him the smiling man and a figure who, for all his hardship, was humble and able to show so much gratitude to others – it is obvious that Hain looks up to him as a model for good political manner. Living with liberal parents in apartheid South Africa, Hain soon became a known figure in the movement against racial separateness. His first public speaking engagement saw him deliver a reading at an anti-apartheid friend’s funeral, that of John Harris, who had been hanged for planting a bomb at Johannesburg Railway Station, exploding and injuring 23 people and killing one 77-year-old woman. Under the suspicions of the South African government, Harris’ lawyer was put under house arrest. Subsequently, Hain’s architect father was fast losing work, a new company he worked for could not secure government contracts, so it was their tough decision to leave for south west London, where they set up home, and young Peter Hain’s political project took on new horizons. Kakistocracy is a word the Greeks referred to as government ruled by those who are least qualified and most unprincipled to do so. Nowehere was this more relevant than in South Africa. Hain was no longer subject, directly, to the South African state, but his aggression towards it did not cease. Opposed to violence, he joined with the Stop the Seventy Tour Committee who took to direct actions disrupting cricket games wth pitch invasions highlighting the hypocisy of allowing the white South African cricket team the freedom to tour England. Eventually, he notes, his socialism crystallised in 1968-9, with the Paris uprising, the rise in student movements up and down Europe and the US, opposition towards the war in Vietnam and the Soviet invasion of Czechoslovakia. The left, he points out, at the time, were as much against capitalism as they were Stalinism – in fact he himself identified as libertarian socialist. Believing wholeheartedly in taking his political message all the way, and not accepting half-measures, he was arrested and put on trial in August 1972 while occupying the Sierra Leone embassy. While in the dock, the prosecution’s star was one journalist, Gordon Walker, who later admitted he was working for the South African Bureau for State Security (a.k.a BOSS) while filing copy for the Daily Express (whose Sunday paper’s long time editor Sir John Junor wrote fantasising about drowning Hain in sewage as he migrated from SA). Only being subject to a charge of disrupting a tennis game, Hain was freed and fined £200 – to which he noted it was “several months out of my active political life”. Trouble would soon follow. In 1972 a letter bomb was posted through his letterbox, handled by his sister and forutnately failing to detonate, while two years later suspicions aroused that he was behind a 1974 bank robbery – a charge he was acquitted of, with allegations that BOSS were behind the framing. Zealous and politically energised, after a long time in the Liberal Youth, where he had once been dragged away from Number 10 Downing Street, he joined the Labour party, with whom he would later be walking towards for his first cabinet meeting, in October 2002. When he first joined the party he sat alongisde the left wing Labour Co-ordinating Committee, and when an MP in Neath in 1991 he immediately joined with the Tribune Group – though his choice of companions seemed far more to do with creating party dialogue than bolstering party factionalism. In 1995 he was invited by Tony Blair – a character Hain had trouble with at the time – to be a whip, not because there was political consensus between the two, but because Hain had the ability. Blair was clear he did not agree with all Hain stood for, and likewise Hain hated what became of the divisions that Blair stood for in the party. Early on Hain made the decision, as a politician, to do exactly the opposite of how Ken Livingstone operated. Ken was not keen on making many friends inside the Labour party, nor particularly bothered with serving any parliamentary bill committees. Hain wanted dialogue, and as he said “winning the next election mattered almost more than anything else”. Remarkably honest, Hain recounts Blair failing to accept that under his watch 4 of the 5 million voters lost from 1997 to 2010 for Labour were lost before 2005. Tony may have been more electable, but Hain accuses Blairites of regurgitating nonsense mantras and trying to blame all loss on Gordon Brown. And so it remains. “People”, Hain notes, “are not joiners any more”, referring to the reason he wanted to give those who had not joined the party more say over Labour’s direction in the Refounding Labour document. But one recognises that this also has to do with Hain’s instinctual appeal to extra-parliamentary politics. For him it is not only about the party, but the people. Of course while he did undeniably good work in Wales and Northern Ireland, he still has his critics. On the left, his calling plans to renationalise failing private utilities “moonshine” marked him out as a New Labour sympathiser, not to mention his support for the Iraq War, while the accusation of him not reporting £100,000 in donations in 2008 and his staffing scandal gave the political right sleepless nights for a while. On the whole, however, Hain proves to be a conviction politician. A man of principal, not bogged down with useless fights when he had a world to win. A reminder that the Labour party is still a natural home for those whose principal aims is to push the agenda of fairness, human rights and progressive change. This volume is highly recommended. This book review was originally published on Left Foot Forward, and on the LSE British Politics and Policy blog on 29th January 2012. Peter Hain gave a public lecture at the LSE on Monday 30 January 2012. For more information see the LSE Events page. Carl Packman is a health researcher, writer and blogger. He has written for the New Statesman, the Guardian, Tribune Magazine, The Philosopher’s Magazine and the International Journal for Zizek Studies. He is a blogger at Liberal Conspiracy, Though Cowards Flinch and he tweets as @carlraincoat.Read more reviews by Carl.